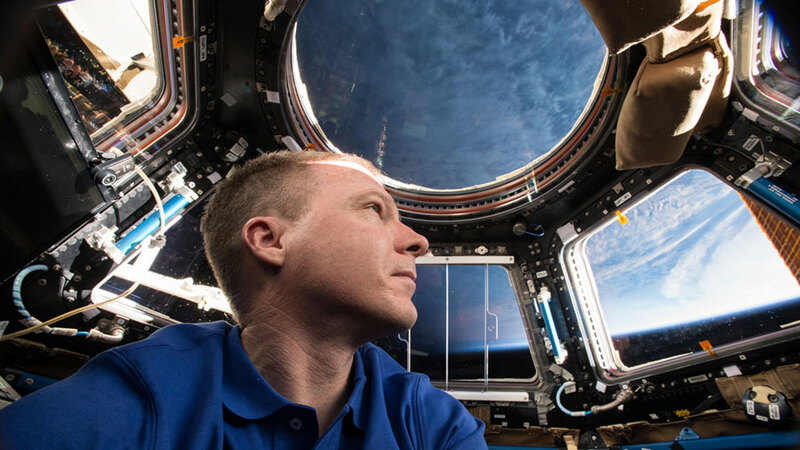 ISS043E241729 (05/24/2015) — Expedition 43 commander and NASA astronaut Terry Virts is seen here inside of the station’s Cupola module. The six-member Expedition 43 crew conducted a variety of advanced microgravity science and performed spacesuit maintenance. U.S. astronauts Terry Virts and Scott Kelly also commemorated 50 years of operations in Houston’s Mission Control Center. The orbital lab’s inhabitants explored a complex set of subjects in space including physics, biology and crew health. Flight Engineer Gennady Padalka studied plasma crystals which could benefit future spacecraft design. Italian astronaut Samantha Cristoforetti continued her work with the Rodent Research experiment that could potentially lead to new drugs to treat diseases on Earth. One-Year crew member Mikhail Kornienko was back at work on the Fluid Shifts study partnering with Kelly and Padalka. The trio took measurements as part of an investigation to better understand how microgravity impacts fluid pressure in the head, changes in vision and eye structures. On June 3, 1965, Mission Control Center in Houston began operations when Gemini IV lifted off for a four-day mission with astronauts James McDivitt and Ed White. America’s first spacewalk also took place during that mission when White floated out of the spacecraft attached to a 25-foot umbilical line and tether. I was wondering does any electronics on iss use vacuum tubes? There are no vacuum tubes on orbit. This is mostly due to concerns with glass (potential sharp edge hazard) and since it’s a relatively obsolete technology. Are you guys going to be able to live up there until you die of old age? Do you have a stable food supply, water and oxygen? Space station crews typically stay in space between five and six months. However, there are two crew members, NASA astronaut Scott Kelly and Mikhail Kornienko, who are staying in space for a year. The space station is stocked with plenty of oxygen, water and supplies. Russia, Japan, Europe and a pair of U.S. commercial companies have all launched resupply ships to the station.